When I was struggling with hip arthritis, Ardha Chandrasana was the pose that could realign my femur in its socket when it went out of position. Gradually after my hip replacement, I became strong enough to perform the pose again, which was a small but important victory for me. I enjoy teaching this pose to newer students who have the basic standing poses under their belts because doing the one-leg balancing thing will shake them out of any complacency. 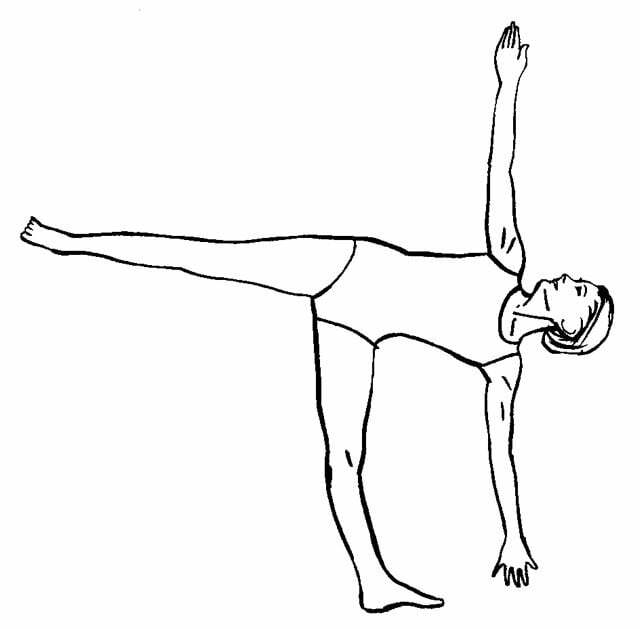 Beginners can do this pose, using a wall sort of like training wheels to get the feel of balancing on one leg, and then the teacher will wean them off the support as soon as possible. For more advanced students, a particularly good refinement is to lift the pelvis away from the hamstrings of the standing leg until and feel the stretch of that leg’s connective tissue. There’s something about doing this pose that makes me feel like I’m flying when I am in a moment of poise and my body opens up to it. I suppose that feeling reflects the translation of the name – Chandra meaning “moon” or “luminous” in Sanskrit. Maarit’s beautiful drawing captures this feeling perfectly. Thank you for mentioning me, Eve. I have done this pose quite soon after the operation, using the railing of the landing as support, now I am able to do it free standing, such a freedom, as you said, it is like flying.